Bangladesh (officially called People's Republic of Bangladesh) is a country in South Asia. It is next to the North-east Indian provincial regions of India, which converges with Southeast Asia to the east. Its full name is The People's Republic of Bangla-Desh. The capital and the largest city is Dhaka (also spelled 'Dacca'). Bangladesh is surrounded on all three sides by the Republic of India (Bharat), and Myanmar (Burma) on the south-eastern corner, it is near the People's Republic of China, Bhutan, Sikkim and Nepal. Its independence was fully realised after it declared it self as independent most of 1971 from Pakistan after a bloody war in which over a million people died. Later by Indian military intervention, by that time the provisional government went into exile in Calcutta, Bengal (India) which they considered their homeland to be under Pakistani military occupation. After the Instrument of Surrender, the Bengali peoples became a sovereign nation and when its founder was released from political imprisonment had returned in 1972. 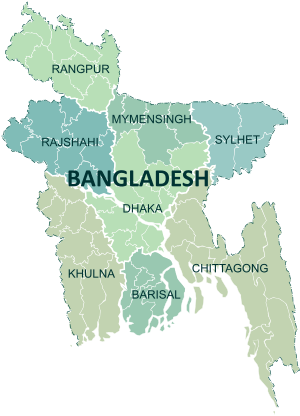 Present-day Bangladesh has an area of 56,977 mi² or (147,570 km²). Islam took in shape foothold in the 13th century. Bangladesh used to be called East Bengal, after they had fought hard for a Muslim homeland in 1947 and was made a part of United Pakistan, However by 1955 its citizens were commonly referred to as East Pakistanis. Dacca was then the legislative capital of Pakistani Bengal provincial region. The peoples of East Pakistan were mostly ethnic Bengalis who had a different language and culture to the people of western Pakistani. These differences eventually led to the Bangladesh Liberation War. On 16 December 1971, Bangladesh gained independence, with the help of allied forces against West Pakistani forces. Despite 30 years of independence, Bangladesh is still a poor country and has problems with corruption and political troubles as the other country have. Presently more than half of the people can read and write. Bangladesh has heavy cyclones and natural disasters, which because of carbon release at a higher ratio by Rich Country and warming the world. Due to this many lives are often lost. The country is one of the most densely populated in the world. Cyclones are very common in the Bay of Bengal during the middle of the year, particularly in the south of country in areas like Sundarban, Chittagong, Cox's Bazaar or in neighboring Myanmar and Republic of India. Despite the many storms, Bangladesh does not have a very effective storm prevention system, and cyclones usually inflict heavy damage. Bangladesh is divided into seven administrative divisions,: Barisal (বরিশাল), Chittagong (চট্টগ্রাম), Dhaka (ঢাকা), Khulna (খুলনা), Rajshahi (রাজশাহী), Sylhet (সিলেট), and Rangpur (রংপুর). The sari is by far the most widely worn dress by Bangladeshi women. In urban areas some women wear western attire. Among men, western attire is more widely worn. ↑ 1.0 1.1 Central Intelligence Agency (2011). "Bangladesh". The World Factbook. Langley, Virginia: Central Intelligence Agency. https://www.cia.gov/library/publications/the-world-factbook/geos/bg.html. Retrieved 5 October 2011. ↑ 3.0 3.1 3.2 3.3 "Bangladesh". International Monetary Fund. http://www.imf.org/external/pubs/ft/weo/2011/01/weodata/weorept.aspx?pr.x=46&pr.y=7&sy=2008&ey=2011&scsm=1&ssd=1&sort=country&ds=.&br=1&c=513&s=NGDPD%2CNGDPDPC%2CPPPGDP%2CPPPPC%2CLP&grp=0&a=. Retrieved 20 April 2011. ↑ "Human Development Report 2010. Human development index trends: Table G". The United Nations. Archived from the original on 5 December 2010. http://web.archive.org/web/20101205181756/http://hdr.undp.org/en/media/HDR_2010_EN_Complete.pdf. Retrieved 14 July 2011. ↑ "Rangpur becomes a division &#124; Bangladesh". bdnews24.com. 25 January 2010. http://www.bdnews24.com/details.php?cid=2&id=151976&hb=top. Retrieved 6 August 2011. ↑ 9.0 9.1 "Statistical pocket book Bangladesh – 2008". Bangladesh Bureau of Statistics. Archived from the original on 26 October 2009. http://www.webcitation.org/5koIesa9t. Retrieved 10 October 2009. ↑ "Bangladesh Buruae of Educational Information and Statistics". Banbeis.gov.bd. http://www.banbeis.gov.bd/bd_pro.htm. Retrieved 3 July 2010. ↑ Logan, Stephen (2008). Asian communication handbook 2008. AMIC. p. 115. ISBN 981-4136-10-7 . ↑ Reuters (25 September 2006). "Cinemas in Bangladesh, Pakistan squeezed by Bollywood". NewIndPress.Com. http://tvnz.co.nz/content/835893/3362663.xhtml. Retrieved 2 May 2008. This page was last changed on 4 October 2014, at 14:27.